Yankees second baseman Starlin Castro has landed on the DL after straining his hamstring last night. In a parallel universe, a parallel me is writing this article about Gleyber Torres, whom KATOH+ regarded as the No. 2 prospect in baseball behind Vlad Guerrero Jr. But since Torres’ season recently came to an end, the call-up goes to Tyler Wade, who is an interesting prospect in his own right. A fifth-round pick out of high school in 2013, Wade put himself on the prospect map when he slashed .280/.343/.353 as a 20-year-old shortstop in High-A. He built upon that with a solid campaign in 2016 and hit an excellent .313/.390/.445 this year. He’s been especially hot of late, slashing .366/.455/.505 with 11 steals over his last 25 games. Wade hasn’t hit for a ton of power in the minors — his career ISO is just .085, though it ticked up to .132 this year — but he does just about everything else offensively, including making contact, drawing walks and stealing bases. Wade has played shortstop, second base, third base and all three outfield spots this year. However, most of his reps have come at short. He hasn’t graded out well at the position by Clay Davenport’s numbers, but given how the defensive spectrum works, it stands to reason that he’d be fine at second base. The fact that he’s remained at shortstop all the way through Triple-A is telling. KATOH is a Wade fan, projecting him for 6.7 WAR over his first six seasons by stats-only KATOH and 5.8 WAR by KATOH+, which incorporates his prospect ranking. Those marks place him 38th and 52nd, respectively, among prospects. To put some faces to Wade’s statistical profile, let’s generate some statistical comps. I calculated a Mahalanobis distance between Wade’s Triple-A performance and every season since 1991. In the table below, you’ll find the 10 most similar seasons, ranked from most to least similar. The WAR totals refer to each player’s first six seasons in the major leagues. A lower “Mah Dist” reading indicates a closer comp. Wade isn’t the sexiest prospect out there. His has little power to speak of and he doesn’t stand out in any other area — offensively or defensively. But taken altogether, his skills make for a promising package. His ability to get on base is encouraging, especially coming from a speedy middle infielder who has been substantially younger than his competition. The 22-year-old should receive regular at-bats for the time being, and my math suggests he has a bright future ahead of him. We hoped you liked reading Projecting Tyler Wade by Chris Mitchell! Pitch Info Data on FanGraphs! I always love the Katoh projections – thanks for providing them every time a high-caliber prospect is called up. It’s interesting to see when there is a stark difference between Katoh and the other projection systems Fangraphs displays (steamer, depth charts, etc) on the player page. Wade’s current steamer projection amounts to a 75 wRC+. Even at SS, a line like that is hard to make replacement level! While recognizing Katoh shows long-term (5+ year) projections, where do the different projection systems disagree/differ? I understand Katoh is proprietary so I’m not need specifics, mostly curious of how the two projections could see the same player so differently. I feel like the projections are accounting for the range of outcomes. Something like a 2-in-3 chance he’s a replacement level/1 win full season guy, and a 1-in-3 chance he’s about a league average regular or better. That averages out to 1/2 WAR *2/3 + 2 WAR*1/3, multiply that by six season and account for the typical aging curve, you get around 6 wins. The median projection there is still about a 75 wRC+, but the chance he’s a >90 type of guy is still there. I think Phillies’ comment is definitely part of it. It’s also worth noting that KATOH and Steamer answer different questions. KATOH takes more of a long-term approach (6 years), while Steamer is only concerned with the next three months. Even so, Wade’s Steamer projection feels low to me. 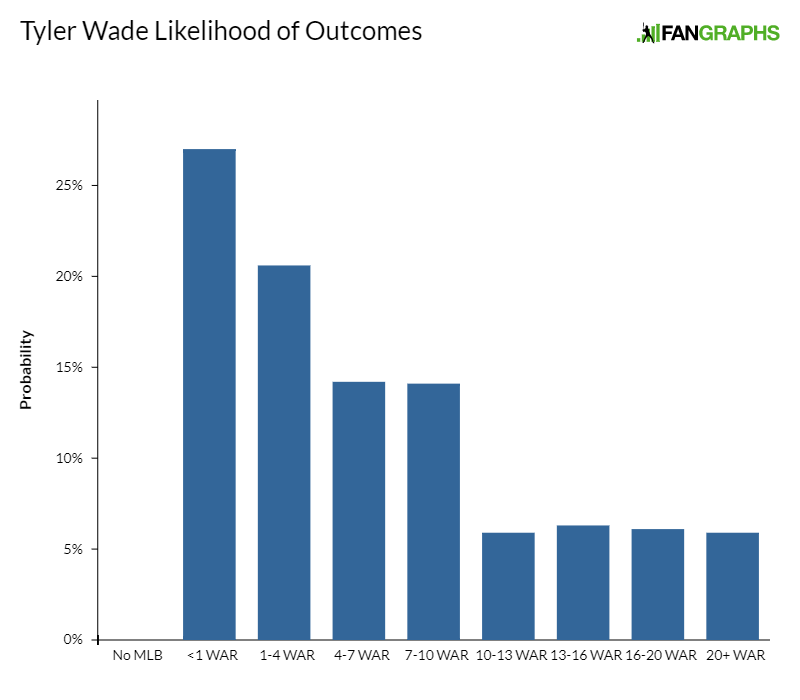 Perhaps it puts a lot of weight on Wade’s iffy Double-A numbers from 2015/2016.